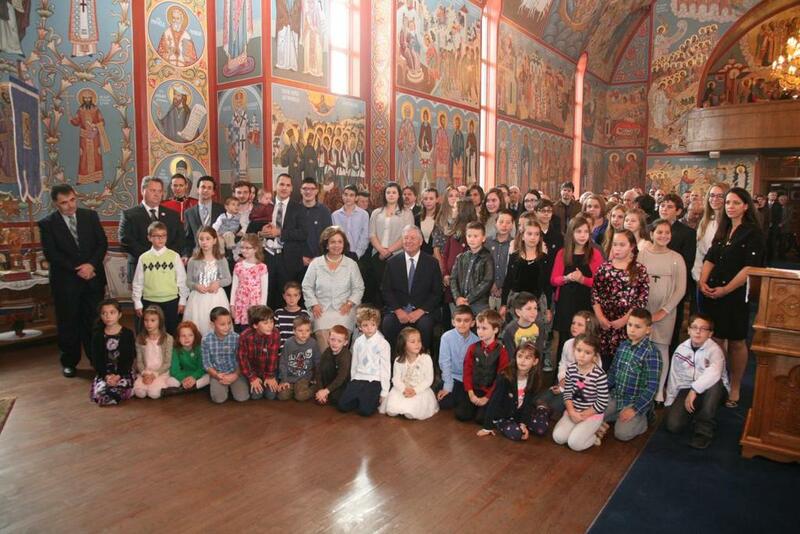 Hamilton, Ontario - The beautiful and spacious St. Nicholas Cathedral in Hamilton (Barton St) was small to receive all the faithful who travelled from all ends of Ontario to take part in the great spiritual and national joy which occured on Sunday October 25th. 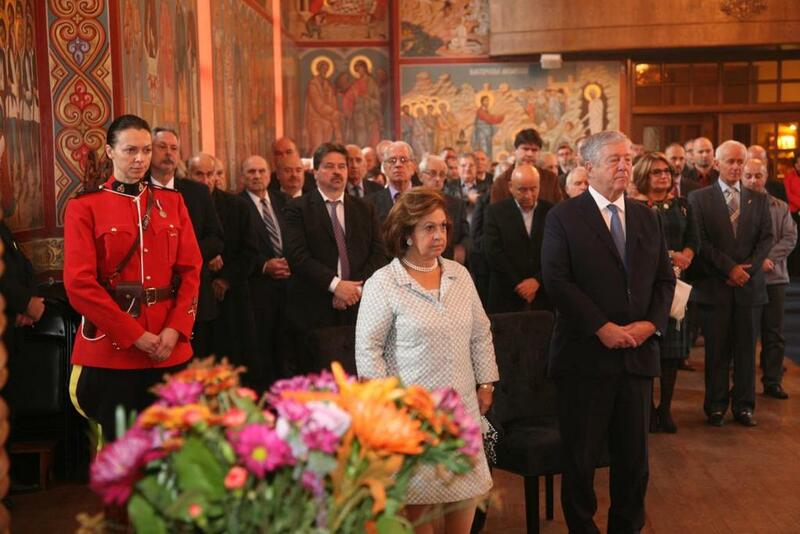 The occasion was the visit of Their Excellencies the Crown Prince Aleksandar and Princess Katherine Karadjordjevic but also the visit of His Grace Bishop Longin on New Gracanica and Midwestern America. The Holy Hierarchical Liturgy began in the filled church at 10AM with the beautiful singing of the responses by the "Stevan Mokranjac" choir. 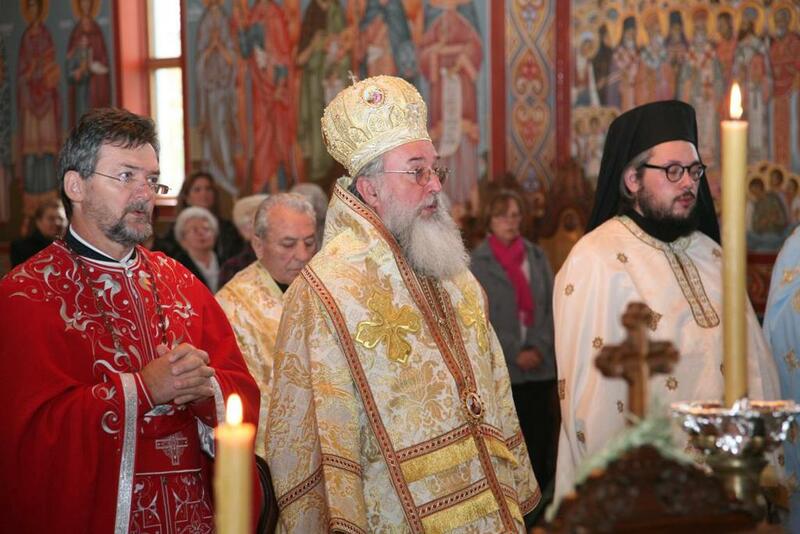 Serving the liturgy was His Grace Bishop Longin with the con-celebration of V. Rev. Stavrophor Stevan Stojisavljevic, Protosindjel Vasilije (Gavrilovic), V. Rev. Dobrica Obradovic, Protonamesnik Milos Puric and V. Rev. Stavrophor Vojislav Pavlovic, the cathedral dean. What particularly added to the beauty of the service besides the presence of Prince Aleksandar and Princess Katherine was the large number of school children, who partook of the Holy Mysteries of Christ. After Communion Bishop Longin addressed the congregation with a homily in both languages on the theme of the gospel reading - the sower and the seed. Following the inspiring homily which entered into the hearts of all the faithful, the bishop, on behalf of the clergy, monastics, benefactors and laborers of this holy church and the faithful greeted Their Royal Excellencies and welcomed them to this God protected diocese and St. Nicholas parish and a succes and good health in their God given service in leading the honorable Serbian people. While the Bishop distributed the antidoron- which took nearly half an hour- the Prince and Princess went to the school classrooms where the the joyous children, their parents and teachers awaited them. Afterward, they were taken to the main hall which was filled to the last spot. For all of them, around 450, a wonderful meal, drinks and music was prepared. The banquet began with the formal entrance of Prince Aleksandar and Princess Katherine to the tune of Tamo Daleko and the loud applause of all present. During the banquet Rajko Djurdjevic, president of the St. Nicholas Church School congregation, greeted all the guests, and speaking were also Bob Bratina, member of the Ontario Parliament, Princess Katherine, Bishop Longin, Nada Popovic and Judy Djurdjevic. Emceeing the program were Snezana Popov and Aleksandar Stosic. A few local folklore groups also performed during the program. The Serbian people greeted all of them with applause and joint pictures which, at the same time, represents the best evaluation of this all-national spiritual and nationalistic celebration. Thanks to all who took part in preparing the banquet, especially to the Kolo Sestara for a wonderful lunch. We thank our dear Crown Prince and Princess and our dear Bishop Longin. And thanks, in the end once again, for this beautiful day, before all and above all to our God in Trinity, Father, Son and Holy Spirit to all the ages. Amen.